The value of Kenton's music varied greatly according to the arrangers he used. The innovations band of 50/51 was already playing compositions and arrangements by Shorty Rogers, Pete Rugolo and Ray Wetzel and the band had in its ranks major soloists such as Shorty, Bud Shank, Art Pepper and Bob Cooper. January and February of 1951 saw the band plying at the Click Ballroom in Philadelphia, doing one nighters from Niagara Falls to Los Angeles, and playing to 16,000 fans during one week at the Hollywood Palladium! 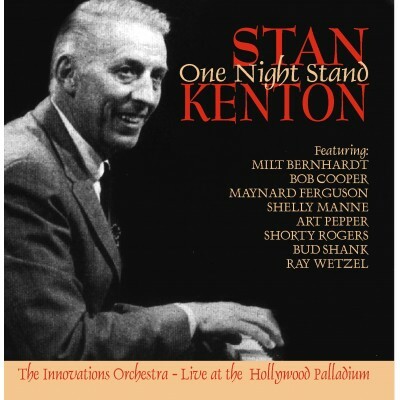 In late February and most of March that year, the band was heard in live broadcasts from the "dining, dancing and entertainment centre of the west" over CBS and participated in several AFRS One Night Stands from which this atmospheric selection on this disc are taken.